At several sites, guardian stones have been so arranged that the corner blocks jut out at an angle from the phalanx of stones. For example, the simple dolmen of Frauenmark, Parchim county, and the passage grave of Mellen, in the county of Prignitz. 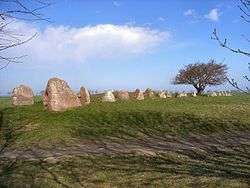 At the large passage grave of Naschendorf, Nordwestmecklenburg all the blocks at the narrow end are arranged in a concave way, so that the corners are very prominent. The same shape is seen at the wide end of the trapezoidal bed of Kruckow, Demmin county.